I have been reading Christina Rossetti's poems again. There is one called Winter Rain I love, and one passage in it really resonated with me last night as I read it. Nest and egg and mother." I've just been checking this week to see if the tiny mother finch would come back to nest again in my hedge and there she was! But I will leave her in peace this year. I looked at the photos I took last spring in the bower of my own tightly canopied cotoneaster hedge. I worried over this spot for days, then missed the chance to see the final "flight" when I had to leave the city. When I came back the nest was empty. The finch was a wary little mother but I was able to take one shot of the four eggs and then, later, two very fast shots of the hatchlings, (three survived) so the little chicks asleep are a bit blurred. One is lying on his back sound alseep, the second crushed up beside him also asleep and the third is tucked there on the right with his wing over his sibling. I feel both tenderness and fear when I look at this photo. 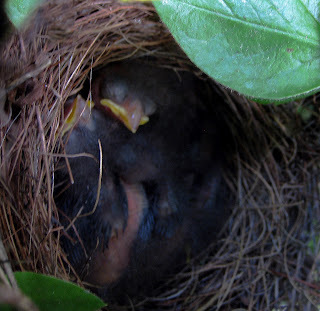 The nest itself was less than three inches across, so you can imagine how tiny these hatchlings were. Did they fly away? I hope they did. Lovely poetry and the pictures of the birds are so sweet. 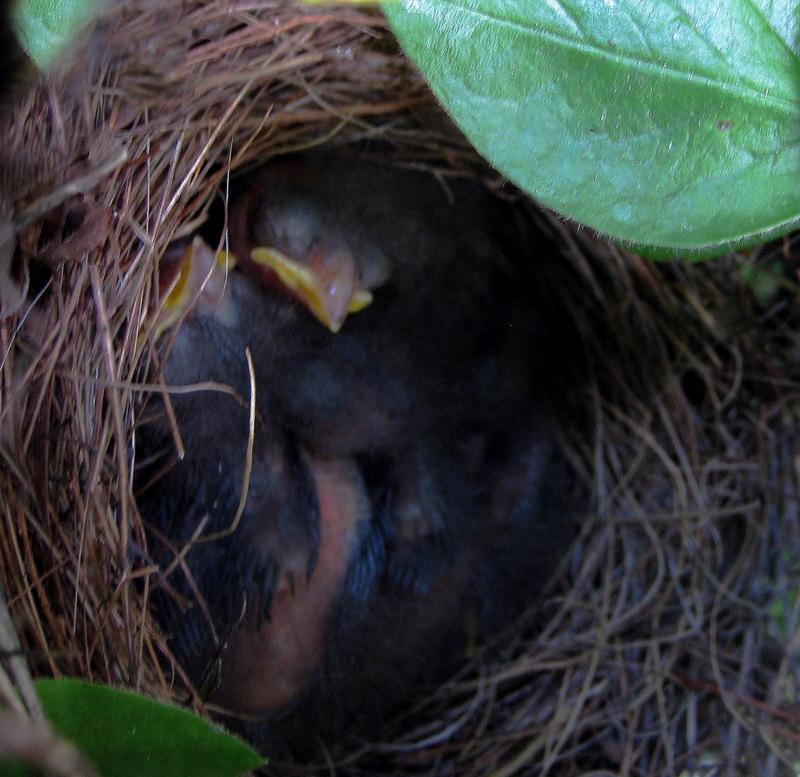 We have a sparrows' nest in the Cedar against our house. The branches facing our window are sparse and the birds flitting from branch to branch are a source of fascination for our cat! I'm glad there is glass between them. I sympathize, Susan. I got pretty stressed over those tiny birds. I like to think the next door cat didn't get them when I was away. They had most of their feathers when we left for the lake ... and then they were gone. But the mother is back in the same spot. I have to let nature take its course or I'll be a wreck. As it is I have to worry about the loons on our nearby island. A few years ago a bald-headed eagle kept trying to swoop down and grab the two babies. I used a metal spoon and a cake tin - bashing them together to drive it off. The cake tin is still badly dented!! !